Easter Yard Signs great for marketing to the community, directions on campus and parking signs. 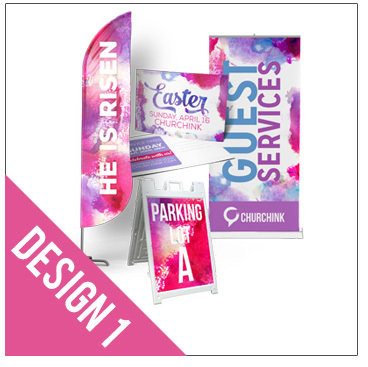 Easter yard signs are an affordable advertisement option for members to promote your Easter weekend services. Our full color printed plastic signs have excellent weather durability. Fluted tubes in the signs allow for "H-stake" mounting, making it easy for lawn installation. Choose between 1-sided or 2-sided printing to maximize your advertisement! PLASTIC STAKE OPTION - 'Y-STAKE' is more attractive, sturdier and stands out! To speed up your order, make sure you read"How to Prepare Your Artwork"